A garden dedicated to the clients' recently deceased mother, as well as for her beloved Hindu spiritual leader, Amma, "the hugging saint". It features photos under glass of both of these women. The client loves that these images will slowly fade as the light does to them what it does to everything, at varying degrees. And, I have to agree. The ephemeral nature of all things is at the core of this piece and its setting. Placed at the heart of a beautiful and abundant garden, the pedestal invites the bees with its honeycomb pattern. Bees are our Earth's ultimate pollinator, the mother of us all, and so they appear on all three pieces. 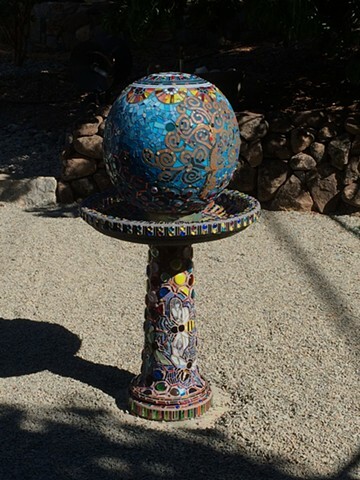 The garden globe features many pungent symbols of love, connection, and abundance. The Om symbol, done in dazzling mirror, rises from the flower petal suns. Basking beneath is a Tree of Life a la Gustav Klimt, and in the blue sky, of course: a few more busy bees.